We often hear about direct venting pellet stoves, i.e. stoves that work with a simple wall smoke outlet. Actually it is not the case. Smokes, more correctly called "Combustion Products" (CP), should always be discharged above the roof of the building, outside of the reflux area, so that they can be dispersed in the best conditions in the atmosphere. This applies to all combustion fumes, whether from natural gas, wood or pellets. A flue that discharges smokes up to the roof ridge is therefore always necessary, even if in the event of pellet stoves. However not particularly cautious installers may suggest a simple hole in the wall, instead of a flue and a chimney, claiming that this is enough to make it work. It is true, a pellet stove can still work even without the flue, because it works with forced ventilation. The reasons to simply answer "no thanks" to this type of offer, however, are several and serious. Listed below are the three most important reasons for which wall installation should be avoided. 1. The wall installation do not comply with law. European legislation, related to safety, energy and environment, is very clear. Combustion plants must be constructed so as to facilitate the dispersion of smokes into the atmosphere. Specifically, flueless pellet burners contravenes several Italian laws: the DM 37/08, the UNI 10683 and Presidential Decree 412/1993 (in particular Article 9). All these laws foresee that the wood- and pellet-burning heat generators must be provided with flue system with roof outlet, without exceptions. Wall installation is not allowed in any case. In addition to national laws, there are other local health and building regulations (Municipal Building Regulations, Hygiene Rules) that go in the same direction and impose flue gas exhaust of any fuel over the ridge of the roof. 2. Wall installation is harmful to health. particulate matter") which, if not dispersed properly, affect the air quality in a negative way. Discharging the fumes at eye level is therefore a practice that not only does not comply with regulations, but it is also uncivilised, worsening hygienic conditions, environmental protection, and - not least - good neighbour relations. 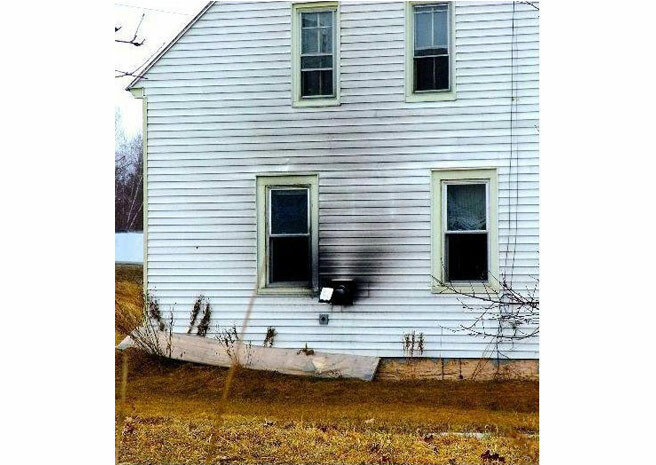 In fact, cases of complaints are not uncommon from neighbours exasperated by lingering smoke and black marks on the wall due to non-combustible residue and unsuitable outlets. 3. 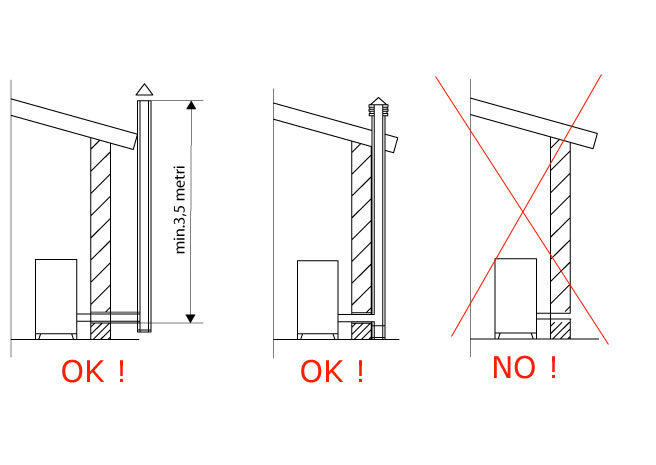 Manufacturers will void the product warranty in the event of wall installation. All stove manufacturers openly discourage installation of pellet stoves without a flue and void the warranty on products installed this way. The first reason is related to the quality and performance of the product, which can only be ensured with proper installation. The stove, deprived of the draught that would be ensured by the flue, cannot maintain the efficiency declared by the manufacturer and therefore with equal consumption, it will be much less efficient. The second reason is related to safety. A pellet stove works with forced draught and the combustion fumes are expelled through an electric fan. If the stove is blocked due to a power cut, pellet feeding is also blocked, but in any case enough smoke could be generated to fill the rooms. The fumes, not expelled by the fan, would filter through the stove door with obvious damage to property and people. If the electricity is disconnected but there is a flue with a chimneypot at least three metres above the level of the brazier, the result is enough natural draught to expel fumes outside without fan extraction. The safety of the pellet stove is therefore ensured in full even without electricity.